Graeme Samuel AC is a corporate advisor with specialist expertise in competition and consumer regulation, communications and media, corporate governance, strategic planning and change management, public policy and dealings with government and regulators. Best known from his role as Chairman of the Australian Competition & Consumer Commission from 2003 to 2011, Mr Samuel’s professional and public service roles have helped change the landscape of Australia’s business competition environment over much of the past few decades. Graeme Samuel’s professional career has spanned senior roles in law, investment banking and public service, covering sport, health, the arts, business and public policy in economic reform and regulation. Mr Samuel’s professional career commenced as a Partner of the law firm Phillips Fox & Masel (now DLA Piper) from 1972 to 1980. He then became Executive Director of Hill Samuel Australia Limited and subsequently Macquarie Bank Limited from 1981 to 1986 and co-founder of Grant Samuel & Associates in 1988. In the early 1990’s Mr. Samuel moved into several roles in public service. 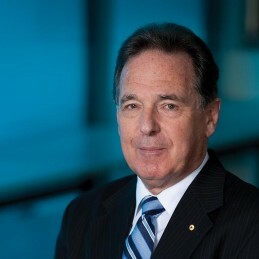 The most notable of these was his membership of the National Competition Council from 1995 and Presidency of the Council from 1997 – 2003, followed by his appointment to the position of Chairman of the Australian Competition and Consumer Commission in 2003 and subsequent appointment as an Associate Member of the Australian Communications and Media Authority in 2007, both of which positions he held until July 2011. Prior to taking up his position with the Australian Competition & Consumer Commission he was Chairman of the Melbourne & Olympic Parks Trust, a Commissioner of the Australian Football League, a member of the Board of the Docklands Authority, and a Director of Thakral Holdings Limited. He relinquished all these offices to assume his position with the ACCC. He is a past President of the Australian Chamber of Commerce and Industry, a past Chairman of Playbox Theatre Company and Opera Australia, a former Trustee of the Melbourne Cricket Ground Trust and former Chairman of the Inner & Eastern Health Care Network. Mr Samuel holds a Bachelor of Laws (Melbourne, 1968) and Master of Laws (Monash, 1977). Graeme Samuel AC is a Vice Chancellor’s Professorial Fellow in the Faculty of Business and Economics, Monash University. He is a member of the Council of The Australian National University. He is also a member of CEDA’s Council of Economic Policy. In 1998 Mr Samuel was appointed an Officer in the General Division of the Order of Australia. In 2010 Mr Samuel was elevated to a Companion in the General Division of the Order of Australia – for eminent service to public administration through contributions in the area of economic reform and competition law, and to the community through leadership roles with sporting and cultural organisations. This is the highest level of recognition for an Australian citizen. Currently, Graeme Samuel is the Chair of the Victorian Taxi Services Commission. He is currently the National President of Alzheimer’s Australia, and has been been on the board of Alzheimer’s Australia Victoria since October 2013, and has been a commissioner on the Australian Rugby League Commission since November 2013.